We are professional and dedicated to quality service. We are highly skilled and committed to training and education so we can offer you up to date looks and services. We believe you deserve the finest techniques and the best service every time. 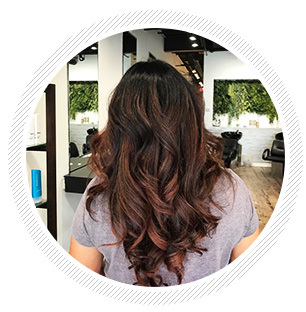 We offer expert hair cutting, styling, facial, latest color techniques including Balayage and Ombre. Reserve Your Salon or Spa Appointment Today. "Jelena deserves more than only 5 stars! She loves her job and is real professional ❤ I'm so glad I met her and I recommend her and this salon to everyone😊❤"
"Excellent! Perfect for all ages and modern inviting feel, they recently remodeled and it looks great." "Jalena, salon owner, is a gift from the hair stylist gods. She is the first hair stylist I have stayed loyal to in 10 years, and I have now been seeing her for almost 2. She is high-end technique without high-end ego. Unlike the scissor happy stylists in large, pretentious salons in the city - Jalena listens to what you want. She understands that a person's hair reflects who they are, and gives haircuts that do just that. You get what you want, and come out of her salon looking like yourself - but upgraded :) Jalena is seriously everything you want in a stylist. She has owned the salon for 20 years and couldn't have more experience. Staying updated on the latest techniques, styles, and trends, is a priority of hers. She monthly attends classes and workshops to be as knowledgeable as possible. I trust her with my hair. She is also an INCREDIBLE colorist. I decided I needed a change from my dark dark brown hair. I've always felt I'm a red head at heart, and Jalena made it happen. My hair is a true Auburn which I get compliments on all the time. The color has stayed true to tone. Red is a very difficult color to maintain, but it has been rather effortless. I drive to the suburbs from the city to get my hair done by her, and will continue to do so." "Best hair cuts I've ever gotten, period! I've been going here for the past 5 years and Jelena always does a wonderful job. She's very skilled, creative, and up to date on all the trends. I'm always getting compliments about my hair." Home / Services and Prices / Spa / Salon Gallery / Contact Us / Copyright 2019 © Golden Scissors Hair Studio. GS Hair Studio / Salon and Spa / Beauty Salon in Niles / Serving Morton Grove, Des Plaines, Glenview, Park Ridge.